My brother-in-law, Shawn, makes these cookies during the holidays when we are all together; am sure he makes them even when we are not! I never really thought about it until this year, but, it is not really Christmas without these little buttery bites around the house. When we arrived in Boston last week, I had them on my mind, 24/7 and decided we should make them for a few of our favorite Bostonians. This recipe is so simple that you could even whip them up for those last minute hostess gifts during the holidays or for an extra little something sweet to have around the house. Be forewarned, you cannot stop at just one! Combine all ingredients except confectioners sugar, mix until thoroughly blended. Using hands, roll dough into balls 1 inch balls. Place 1 inch apart on ungreased cookie sheet. Bake 15 to 20 minutes, or until cookies are set, but not brown. Let stand 1 minute before removing from cookie sheet. Remove to wire rack and cool slightly. Roll in confectioners sugar while still warm; cool completely. Just before serving, reroll in confectioners sugar. 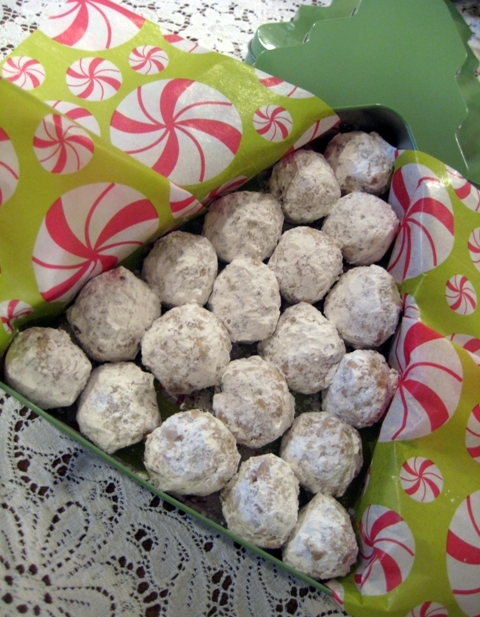 4 Responses to "Pecan Rum Balls"
I love having some desserts/treats that you can make in a flash. These sound delicious. Love the idea of pecan. Happy holidays! Does the rum cook out? We always have kids around the holidays, and just wondering if I should keep these out of their reach?